EightVFX is a visual effects studio established in 2004. They have a 10,000 sq ft studio in Santa Monica, CA and another one in New York City. Most recently the team have completed work on I, Tonya, The Orville and Stranger Things in addition to a decade of experience working in commercials. The company has approximately 60-70 employees. For this film they handled some 200 VFX shots, ranging from skating shots with CG crowd and face replacement so more subtler elements. For example TV screens, graphics and shots where we needed to stitch multiple plates together to make it one seamless scene. The team did some complex stitching shots for the film. There were long takes made up of multiple plates, seamlessly stitched together. Some of the hardest work was making Margot Robbie skate like Tonya Harding. Much of this was done with via face replacement. The real Tonya Harding was the first woman to successfully execute two triple Axels in a single competition, and the first to complete a triple Axel in combination with a double toe loop. Even finding a current skater who could successfully do these moves today, for reference, was not easy. Although Margot Robbie trained for the role, she was never going to be able to do Tonya's triple axel. Of the small number of people in the world who were able to do it, at least two were training for the Olympics during the time of production. FXG: In the video above we see a mobile light capture rig. It seems like a small LightStage style sphere, but I assume without polarised separate spec / diffuse or was it more advanced than simple photogrammetry? Eisko capture a full range of facial expressions and then provide them as regular blendshapes (aka target shapes, morph targets, shape keys). Their matching technology aims for clean deformations without polygon or texture sliding. Eight VFX: We engaged a company called Eisko out of Paris to capture the scan data. They brought their portable rig to the shoot in Atlanta, where we set up a small studio on location. The material provided was pure diffuse, specular intensity, roughness, displacement and normal maps directly from captured subject. FXG: In addition to any photogrammetry solution, did you capture a full FACS ROM (Range of Motion)? Eight VFX: The rig supplied with the model was based on blend shapes, which had limitations but was a good starting point. Our riggers then completely re-rigged the face to the animators specifications. The model was then supplied complete with textures for a neutral pose and 2 additional makeup looks captured on set. A team from LA were on the shoot, and the shoot data including the head model, were prepped in LA before receiving shots. All the shot work was done in the Eight NY office. 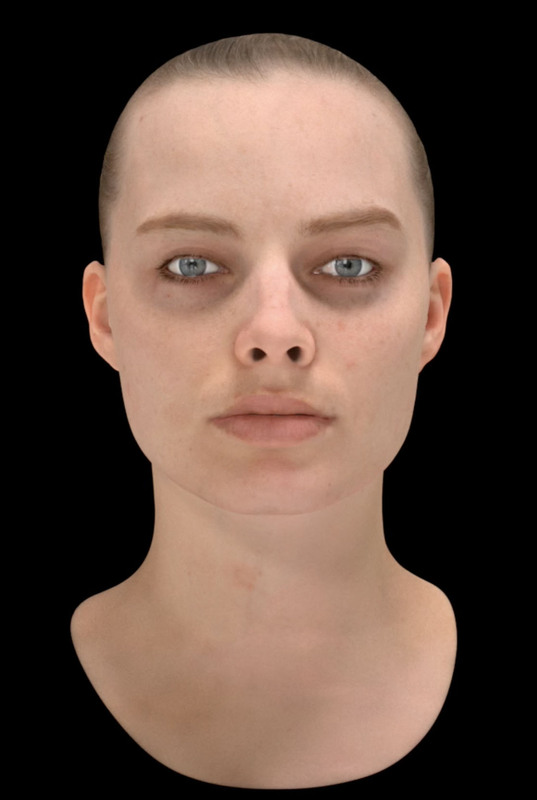 FXG: Was her head hand animated based on reference expressions from the real Tonya from those events or based on the Margot’s acting choices? Eight VFX: The head was hand animated, using a combination of references - the body double performing the skating, and Margot’s acting choices on blue screen. FXG: I understand that on the shoot you had 6 witness cameras around the ice rink. They must have been very wide - so I assume this gave an accurate position, but how did you do lighting? Was it some general HDR from the rink or just matched based on the skill of the TD/Animators? Eight VFX: The witness cameras were used for tracking, and we did capture HDRI’s of each lighting setup on set. Artists also eye matched each shot to make sure they were believable in the environment. Lastly, the director wanted each skating sequence to have its own lighting personality, which we achieved digitally with the artistic collaboration of the director. FXG: Was it hard to match motion blur? Skaters move insanely fast! Eight VFX: Yes! It was a painstaking frame by frame job. FXG: Most Olympics are shot on video with some high speed footage, but this is a film - did you go for 180 degree shutter or 360 shutter (video)? Eight VFX: Yes, as this is a drama we went for an artistic choice rather than the realistic choice so 180 degree shutter was used. The same applies to the lighting of the stadiums, we went more moody than realistic. FXG: What did you render the final images in, what was the pipeline? Eight VFX: Final render was done with Maya/Vray and Nuke and Flame were used for compositing. FXG: What was your favourite scene to work on? Eight VFX: From a VFX standpoint the last major skating sequence at Lillehammer is the favorite. There is a scene which is almost 3 minutes long, created from 3 different shots. The first and last shots have Margot skating for real, and the middle shot has face replacement. Because this is one final shot the middle plate had to be perfect so you can't feel the difference between the real Margot and her CG double. We also re-built the stadium in CG, added CG crowd for the audience and gave the sequence its own look with anamorphic lens flares. It's also a favorite of the editor, Tatiana Riegel and the director, Craig Gillespie. FXG: How did this film/project differ for you from your other projects? Eight VFX: The great thing about this film was the shorthand we had with the director. Jean-Marc, the VFX Supervisor and Craig Gillespie, the director have worked together for many years on commercials, so they already had a good working relationship. Being an Independent film meant we were able to get quick approvals and everyone involved was really helpful in that regard. The producing team were a delight to work with, as was Tatiana Riegel, the editor. Editorial was in the opposite building to our Eight VFX NY office, which really helped with communication. All in all this was a dream project! The one in the foreground reminds me of the Gerry Anderson series “Joe 90”.